Livingston’s trailerable boats filled a market gap at a time when people were downsizing. Ranger Tugs does not have a typical story. 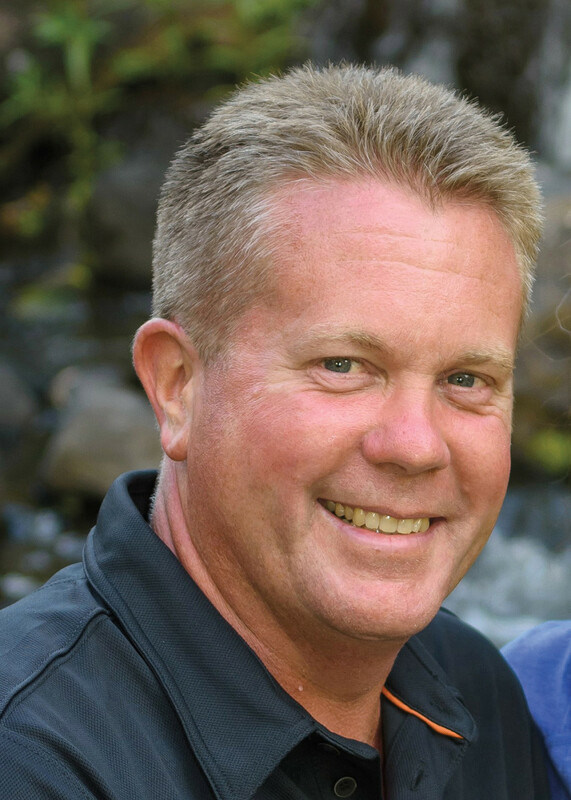 After introducing the R-25 tugboat in 2006, the company actually grew by double digits every year though the Great Recession, says John Livingston, 48, president of Kent, Wash.-based Fluid Motion, the parent company of Ranger Tugs and Cutwater Boats. The tugs appealed more to an older clientele than the overall industry, he says — a couple who, after their children had grown up and left home, still wanted to get out on the water for a weekend with their dog. Or if they wanted to spend a week in Europe, the boat was easy to store. And those customers were more insulated than many during the downturn, he says. “We just think we have a unique boat that way, and there wasn’t much on the market like it,” Livingston says. That success allowed the company to keep investing in R&D when many others had stopped, giving it a competitive edge. Fluid Motion launched Cutwater Boats in 2011, when other companies were still hunkered down. During the past year it has seen about 50 percent growth in Cutwater sales and 40 percent growth in Ranger Tugs sales. The company is poised to expand, hoping to add 40 to 50 new workers to its current staff of more than 200. We caught up with Livingston to hear more about his companies and their success and get background on his boatbuilding history, which literally begins with his mother, who worked in the fiberglass factory while pregnant with him (no fumes jokes, he quips). Q: Can you tell us about your background? You come from a boatbuilding and industry family. What drew you in and made you want to start designing and building boats with your dad? A: I go back as far as when my dad started in the early ’60s. My boatbuilding experience goes back as far as where my mom was running the chopper gun, building little Livingston dinghies for catamaran boats that you’ve probably never seen. Or maybe you have; they’re a little tender or small fishing boat. She was pregnant with me and building boats. So, dad was at Reinell and then Bayliner, so we always had a boat as far back as I can remember. We were always running around somewhere when the sun was out and we could go. We’d go on the Sound around Seattle, up in the San Juans, up into Canada and the Queen Charlotte Straits. When I was finishing college, I was contacted by U-Flex in Italy. They were family friends, and they said they wanted me to start a business here in the United States. I politely told them that was a crazy idea because I had no idea what I was doing with that stuff. They basically said it was a rhetorical question, and from there I was off starting a boat parts business. I basically traveled everywhere after that. I visited almost every single boat company in the United States, peddling boat parts — steering wheels, cables, parts — I probably did that for six or seven years. At that point I decided I didn’t want to travel all over the world anymore and sell boat parts anymore. So I left, and Bill Michaels came in behind me, and they have since moved to Sarasota, but are still going strong today. From there I started building boats. My dad had space in his garage and started building a little 21-foot runabout that had a stepped bottom. Our little claim with that one was that if we could make this ride more efficient, then we can get the same performance with a V6 that everyone gets in a V8 and have a real cost advantage. We finished it, and just about the time we were about ready to go to market with it, we went to IMTEC (the old International Marine Trades Exhibition and Conference) back in Chicago, looking for different parts and pieces. We ran into Paul Kuck, the founder of Regal Boats, who my father knew back in his Reinell days. Next thing you knew we wrote it up, moved to Orlando with the boat and started doing contract work for Regal when they first came out with their FasTrac hulls and runabouts. A lot of that was done in my dad’s basement. We were there for three years; my older daughter is an Orlando baby. From the Regal days, we parted ways and went back to Seattle, where all the family was. We were going to start a new runabout company and do it all again. That was the original Ranger Boats here. Howard “Smitty” Smithson started it in 1958. Ranger was actually his dog. It was a boxer who used to fly with him in his P-40 (Warhawk) plane in the Air Force. So that’s where the name Ranger came from. Anyway, in 1998 I went in to talk with him, and he said, ‘I want to move to Florida, so I’m going to sell you this whole thing at a price you can’t refuse and keep everyone working here.’ So lo and behold, now we have Ranger Tugs. We started building little runabouts. We had the little 21-foot tugboats. People kept giving us money to build these little tugboats, and we started to realize, huh, maybe there’s something to this. We decided to design a [25-foot] tugboat that we launched — or, I should say, we sort of launched — at the Seattle Boat Show. We scrambled to get it done. It’s funny — people still harass me about it. We didn’t quite get the deck tooling done in time, so we took the bottom half of the boat — the whole saloon and hull of the boat was there, just without a deck on it, and we tried to play it off as if we were trying to show off the interior space. It was a success; we sold 13 of them with only half a boat there. I think that was 2006. From there, we’ve added a lot more models in the tugboat line and started doing the Cutwater line, with a similar philosophy but with the Down East styling, just a different flavor of ice cream. It’s got a different look because the tugboat is not for everybody. Livingston’s customers become their “own little community” at the company’s boat-owner gatherings, he says. Q: I believe you have two teenage daughters. Are they interested in becoming the third generation of the family business? A: I have a 17- and 19-year-old daughter with my wife, Jennifer. The 19-year-old is going to the University of Southern California. She is studying computer engineering, which is a cross between electrical and computer science. The younger one is still a junior in high school, so she’s got a way to go, but both have an interest in the business, for sure. The younger one is more interested in the design side of things. From the engineering standpoint I hope the older one comes along, too, because we can always use that. Q: And it’s always nice to see women entering the industry, especially on the science and engineering and technical side. A: Yes, my older daughter joined the Society of Women Engineers, and she was in Philadelphia at the national convention representing USC. She’s always been really good at math and science and figures out the computer things. Thank goodness I have someone at home who can take care of all my problems because I don’t play well with those things. Q: You guys are just getting into outboard power, and I understand the new 30 that was introduced at Fort Lauderdale is the first twin outboard for you. Can you talk about that, and whether you plan to have more outboard models, as well as whether you plan to stay committed to the diesel side? A: We have shifted some models to that. We had three boats in Fort Lauderdale — our little 23 Ranger, with a single 200 outboard on it. We had our 24 Cutwater Sport Coupe — it has a 300 outboard on it — and then the 30-foot Cutwater C-30 Sport Coupe, with twin 300 outboards. It’s new to us as a company. It’s not new to us in building boats; we’ve done that in the past. The R-23 got us into it in the first place. Outboards today are night and day from the old outboards we remember — 2-cycle, blue cloud of smoke. Honestly, if our cabin’s closed on our 23 and you start the engine, you have to go outside to hear the water coming out of the engine. They are so quiet. They’re easy to install, they work really well, they’re a pretty great power package to put in a boat, especially smaller boats. We put it on a platform out back, and therefore there’s a giant cockpit that’s all open, no motor box inside the boat anymore. There’s a big open deck back there for fishing, cruising, entertaining. It frees up a lot of space. The other nice part is, we’ve always done great with the inboard stuff because we sell a lot on the coasts. The nice thing about that boat is you can just pick it up and get the engine out of salt water, which you can’t do with the sterndrives. I would say we’ll do more with outboards, and, yes, we’ll continue with diesel power. I see it more splitting apart, with the cruising Ranger tugboats probably staying a little more with diesel. The Cutwater, which is a little more a fishing, a little go-faster boat, will probably get more outboards. I think there’s a market for both, depending on what you want to do. In the small boat it’s really difficult to beat the outboard, just from the space perspective. They have to give those engines a 3-foot cube for a V6 these days, and it’s hard to fit under the deck until you get a bit bigger boat. That’s where outboards have an advantage. And they’re really nice engines these days. Q: We’ve seen a lot of technology on the outboard side. What about advances on the inboard and sterndrive sides? A: We use Volvo Penta for all our inboard and sterndrive stuff, and the new little V6 gas-powered engine they get from General Motors — that thing is fantastic. It’s strong, smooth, it’s just finding the right boat application to put it in for the sterndrive. But the engine is state-of-the-art, has great fuel economy, smooth, quiet — it’s a nice engine. And the same goes for the diesel; every year it seems they keep improving — high-pressure fuel — they really are a lot cleaner, smoother, quieter. Everything is better about them. 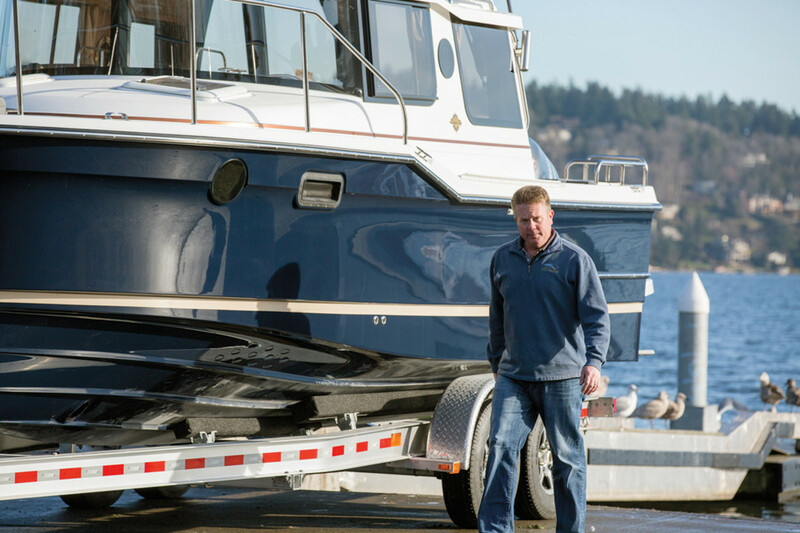 Q: Can you talk a little bit about Pacific Northwest boating and boaters? Sometimes we get stuck on the East Coast, but it seems like a passionate bunch. A: The great part about here — the advantage over you guys — is we can literally boat 365 days a year. We don’t have to stop. The water never gets hard, and it’s never that rough anywhere. Of course, you need a heater to go out, but we literally can take our 23-foot tugboat and cruise all the way up to Alaska — the whole Inside Passage. There are thousands of little islands, and anchorages, and places to see, and waterfalls. It’s spectacular boating. I know my whole family, they’re asking and planning when our summer trip is. We usually go for 10 days or two weeks. That’s one thing we started here. We are our own dealer here in Seattle for at least the Ranger side of things. With Cutwater we have another dealer, but every year we have a big sign-up and we take a big group — it’s now broken into two, with one short four- or five-day trip where we take them up into Canada and go through customs so they know how to do that. Once they have that under their belt, we do a trip to Desolation Sound [in British Columbia]. Usually we have about 45 to 50 boats. We’re limited mainly by the marinas we can find. One year we got up to almost 70. The marinas were like, no, we can’t handle you anymore, you have to limit it. We show them that once you get past the third day, there’s a long run across the Strait of Georgia that can be pretty nasty at times. Sometimes you can water-ski, and sometimes it’s really rough. But once you get up to Desolation, it’s protected, nice easy boating with nice anchorages. They all have this dream of going there, and it seems that if we don’t lead them, they tend to never get there. Once we take them for the first time they make friends, and five or six will go at a time on their own trips and keep cruising from there. We always try to tie in our family vacation around that. We will do a little bit of that. Then my wife, Jennifer, and my daughters, we’ll go from there and spend a week or 10 days as a family. 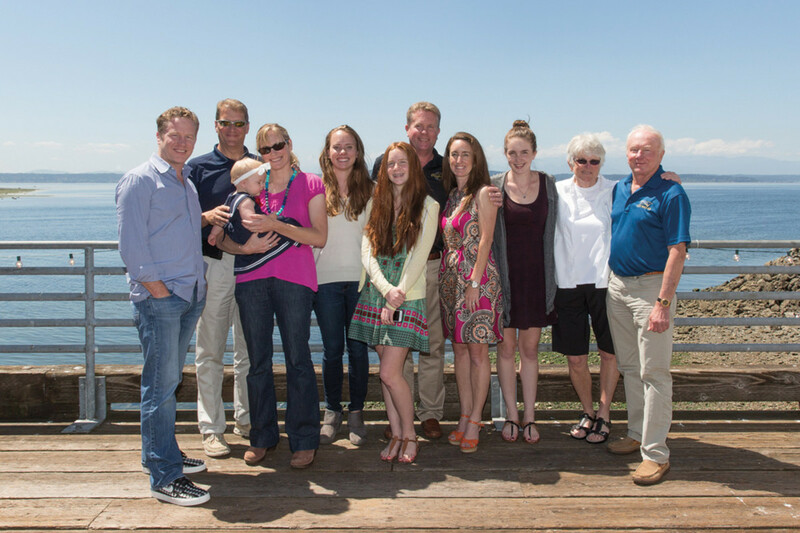 The Livingston family has always been drawn to the water. Q: Wow, 70 boats is a ton of boats for a two-week trip. I talk to dealers all the time, and that seems like the biggest challenge, getting people to show up for these kinds of events because people are so busy. A: That’s nothing. We always have our rendezvous the weekend after Labor Day. We’ve grown every year. This year we had a trip up to the San Juans, and not including all our factory boats we brought along with us, we had 157 customer boats show up. We took over the entire dock. We had big camps, and food and scavenger hunts, a fishing derby, dinghy races. We have all kinds of stuff going on. It’s a lot of fun. Q: How do you get so many people to show up? A: I don’t know. I mean, our cruising type of boats, all our customers are all well above average in how many hours people use the boats every year. It becomes its own little community. It’s a great place for everybody to get together. We bring our entire customer service team — people from the factory, Garmin supplies people, Volvo brings people in. Along with having a great time, we’ll go through and make sure everybody’s software is updated and answer questions on the boat — how to use the boat, service, etc. We’ll go through and make everybody happy while we have everybody in one place. It’s a great way to end the summer every year. Q: And you’re taking them to a destination spot they might be hesitant to venture to themselves, keeping them boating and excited about boating. A: We try to, yeah. In April, before boating really starts, we have people who are interested in going to join us for a Points North seminar. It’s usually a two-day seminar, and we usually have 100 to 120 people. We’ll have experienced boaters or people from the Coast Guard Auxiliary come and do presentations to tell them where we’re going, what to pack, what to expect, and they’ll go through all kinds of scenarios and equipment. So we start prepping them pretty early to get everything in line before we ever go. Q: You must have a unique customer base. I know a lot of people use this term, but some brands really just have almost a cult-like customer base. We’ve got everything from that to someone experiencing something on their boat asking if someone else has had that issue. Our customer-service guy will love it because someone else will say, ‘Oh, no, you’ve got to reset this, and do that;’ they’ll answer their own questions without us even getting involved. It’s been a fantastic forum. Q: What are your biggest markets? A: In total, the East Coast is our biggest market. We’re still our biggest dealer here in Seattle. We have dealers in Canada, Maine, Florida, up and down the West Coast, California, Oregon, in the Midwest, a little bit everywhere. We do export, which has not been a super-strong market with the dollar being so strong, but we’ve sold boats to Russia, Japan, China, New Zealand, Europe. When the economy’s more favorable to the dollar, we do export some. But our main market is here in the States, and Canada, the 51st state. I think our second-biggest dealer is up in Vancouver Island [Port Boat House]. They do a good job for us. That’s a very strong market. It keeps us busy. Q: How many boats do you build? Can you say? A: That’s always my favorite question. We don’t really discuss how many boats we build a year, but we build more than a couple of every model every month, how’s that? We don’t share that information, not to be rude. Q: What’s your model introduction schedule look like? A: A little of that depends on the size of the boat, but we try to have, I don’t know, at least two or three new models every year. This next year we’ll have three for sure, and hopefully a fourth. We’re taking what we’re doing and expanding it into new sizes. We’ll have probably four completely new boats next year, and I’m not saying a new deck freshen-up; they’ll be completely new — hull, deck, the whole shooting match. We have five different factories now, and we try to spread the projects so you don’t bombard a place, and start-up is always a chore when you’re trying to get something up to speed. So we try to spread out which boats go to which plants. We’ll be running fast next year to get all that to happen.